Chinese living in France have shunned the ­"yellow vest" movement that began against a plan to increase fuel prices, and spread nationwide. In their fifth week, protests have caused riots and closure of important landmarks in Paris, but the Chinese community has chosen to stay away, passing information among members to help each other stay safe. Zhang Zhulin, who has been working in France for more than a decade, said the Chinese community in the country is generally indifferent to the movement, which has soared in popularity in French society. "Through the ­movement, Chinese community members are mostly sharing warnings about staying at home as violence rages," Zhang told the Global Times. "Most of them don't like joining the ­demonstrations [unlike the hundreds of thousands who have been hitting the streets]." France has the largest Chinese community in Europe, estimated to number over 600,000, according to a BBC report from 2016. All Chinese people the Global Times spoke to said France was a safe country and the "yellow vest" ­movement wouldn't hurt ordinary people. Zhang believes it is not only the current social ­upheaval that the Chinese have cold-shouldered, they generally ignore all movements. He said that even the younger generation of Chinese in France shows little interest in joining protests. Chinese popular social media app WeChat, as Zhang said, enables the Chinese youth to communicate within the community and lets them ignore everything else. "Besides, the Chinese own independent businesses like restaurants and wholesale markets. This has worsened the seclusion," he said. Despite community calls for participation in French politics, Zhang said that the Chinese still like to maintain a distance from social movements. He believes most of the time Chinese living in France join protests when their own safety is threatened. Lin Hao (pseudonym), a documentary filmmaker in France, doesn't agree with Zhang. He has a different take on the issue. Chinese living in France, Lin said, have different values, they are not part of the ­"protest culture." "The Chinese community isn't isolated from political life. We simply think these ['yellow vest'] protests are unauthentic," he said. 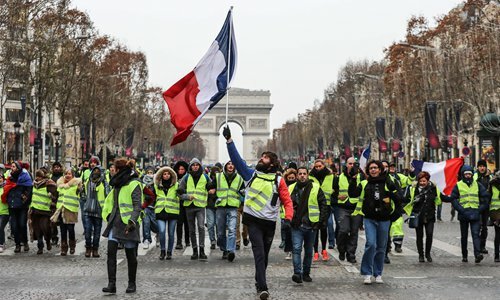 "There isn't a clear demand and it's just smashing and looting by anarchists,"
The "yellow vest" movement, which started over fuel taxes, later transformed into an anti-government campaign against policies of French President Emmanuel Macron seen widely as pro-rich. Demonstrators blocked the streets with burning tires and vandalized shops, attacking police with rocks, media reports said. According to Lin, the movement has spiraled out of control. "This is due to anarchists and incitement by far-left and far-right groups. So, the ­Chinese community doesn't want to jump in," he said. Lin said the Chinese ­community has organized several protests over the past few years and is well versed with French political life, especially the youth who have more adaptability. In September 2016, at least 15,000 ethnic Chinese turned out in Place de la Republique in France following the death of two community members who were attacked by teenagers, BBC reported. Fanqi, a Chinese student in Paris said that the "­yellow vest" movement has developed into a violent and destructive campaign. As the movement draws global headlines, netizens in China have mixed feelings about it. A picture of a Frenchman carrying a flag with the words, "The workers' and peasants' red army," spread on the internet. Some joked that the specter of communism is "haunting" France. Others wondered aloud if the objects strewn in the streets after riots were made in China. Lin said that many Chinese media outlets have hyped up the "yellow vest" movement, which is not that serious. "Chinese people's lives here aren't disturbed. Those mostly affected are the merchants in protest zones," he said. As Christmas is around the corner, businesses in the protest areas have been hit. Important tourist spots in Paris including the Eiffel Tower and Champs-Elysees have been temporarily shut. Countries including Belgium, the Czech Republic and Portugal have advised citizens to delay visits to France, said an AFP report. Currently, there are no estimates on losses to Chinese businesses in France. Fanqi said she doesn't visit some blocks of Paris these days, especially the landmark Champs-Elysees Avenue. But her personal life hasn't been significantly affected. The French government has made efforts to bring down frayed tempers. Macron addressed protestors several days ago, promising to increase the minimum wage by 100 euros ($114) from 2019 and rolling back a tax on pensioners, according to media reports. The "yellow vest" movement itself won't affect Chinese people's immigration and job plans in France, Lin told the Global Times.